Each one of us has experienced loss. Each one of us has experienced pain. And on those blessed days we ourselves are free from suffering, we have only to look out at the world with a compassionate heart to know that suffering is always present. I suspect that this is one of the main reasons people lose their faith: when confronted with the reality of suffering it all seems meaningless. When we come to church on Sunday morning we want to be renewed in hope and gratitude and compassion, but if our religious tradition cannot accompany us to the depths of life, it will not be deep enough support us when we need it most. We are atheists, agnostics and theists together here today, but our common ground is the physical world in which we live. Walking in a path through the woods, or even just through my own back yard I observe that no living being seems to be exempt from pain and loss. All forms of life know death. All forms of life seem to experience destruction and decay. When we drove through Yellowstone park for the first time, we were amazed to see acre after acre that burned during the great fire of 1988. 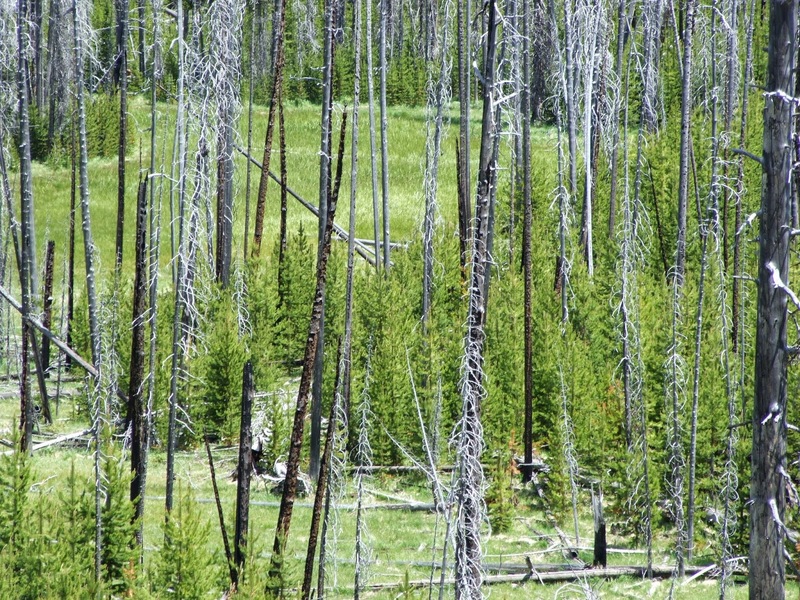 Decades later the charred remains of trees were the dominant feature of that landscape. 248 fires that burned that summer; hHundreds of thousands of acres burned, as the fire raged on for months. The first fires began in July, but it wasn’t until November that the snows had cooled all the fires enough for rangers to assess the damage, to tally the destruction to buildings, to count those elk, deer, moose, bear and bison who had died in the blaze. As the fires raged, so did the political debate about how they could have been prevented, about how we could keep this from happening ever again. Maybe, some argued, if we had allowed more fires in the park in earlier times there would have been less fuel this one summer of drought. Of the 7 major fires that did 95% of the damage, 3 were caused by human hands. So in a very pragmatic way, we know why suffering happens: some is caused purposefully, some by human accident, but the great majority is simply the interaction of natural forces in an apparently impersonal, inevitable way. That is to say, loss is part of life. Pain is part of life. Decay is part of life. Even the sudden, violent force of a great fire, a blizzard, or a tsunami are part of life. By the time we drove through the park in 2007, a new generation of trees and undergrowth and elk had rushed to fill in the scarred landscape. While the charred remains of the burned trees still stood starkly against the sky, an abundance of new growth crowded in dramatically illustrating the way that pain and loss are always followed by new growth, by new life. For those of us whose faith is grounded in the natural world, this is the meaning of suffering; each life that ends feeds the new life that follows. As Wendell Berry writes so elegantly “They die into each other’s life, and live into each other’s death…what they take in they change, but they change it always into a form necessary for its use by a living body of another kind. And this exchange goes on and on, round and round, the Wheel of Life rising out of the soil, descending into it, through the bodies of creatures.” [The Unsetting of America p. 85-86] This is why pagan traditions that grew up in a climate like ours, (where a cold dark winter is followed by a riotous growth of new life in the spring and summer) celebrate the spring equinox as a holiday of rebirth. The earth reminds us with her very body that dark is followed by light, that what seems to be an end is followed by a new beginning. The question of suffering is more challenging question for those of us who believe in not only the immanent presence of the holy dwelling in all living things, but believe in a transcendent God, a personal God who cares about each being. Why would such a god allow suffering? It is easy to imagine that it has something to do with us. It’s a popular theological idea that suffering happens when someone has been bad, that suffering is a sign of God’s displeasure. Being free from suffering, therefor, has something to do with being good, with being faithful. I think the reason we make this leap is more psychological than theological; it allows us to look the other way when we see suffering because “they probably deserve it.” when we see someone suffering we want to assure ourselves that this will never happen to us- if we are good enough, careful enough. When we ourselves are suffering we want to believe that there is something we can do to end it, to control it. But our Universalist tradition does not believe that a loving god would have punished all the inhabitants of those Yellowstone forests for some wrong they had done. When that Tsunami hit Japan in 2011, we do not believe it was the providential hand of God intervening to smite. It was a natural disaster which swept away innocent and guilty, careful and reckless, lonely and loved. As one who was not raised in the Christian tradition, I have always wondered about the centrality of the cross in contemporary Christian Theology. But slowly I am beginning to understand something about that symbol. In Christian Theology Jesus was the incarnation of God. Christ is God manifest in the world, in flesh like ours. Christ’s suffering, which Catholics ritualize in the stations of the cross during lent, tells a story not about a god who punishes the bad with suffering, and protects the good, but of suffering coming even to one who was closest to God. The story of the trial and crucifixion of Jesus depicts a God who took on the suffering of humans, and suffered with us in this world. There has been a great debate throughout Christian history about whether or not Jesus truly suffered on the cross. Some feel that because of his divine nature Jesus escaped suffering, that perhaps even as a man he was so holy that he experienced only his closeness to God. To me that reduces the power of the story. A loving God, a caring God is not one who is exempt from the suffering all living beings share. A loving God is one who knows our suffering, and who suffers with us. When we lay in a hospital bed scared and in pain in a hospital, when facing foreclosure on our family home, or when reeling from a betrayal by someone we loved and trusted, it is natural to feel that God has abandoned us. The story of the crucifixion offers a different perspective- that God is never separate from any part of this living world we share, even when it suffers. As we noticed in the great forest ravaged by fire, new life follows suffering. Jungian Spiritual Director Don Bisson asserts “Suffering, death and resurrection is one mystery. Whenever you try and separate these mysteries, you miss the mysteries.” We know this cold long winter will someday turn into spring. In the Christian story, the crucifixion is followed by resurrection. What we don’t get to know is “why.” Science and our observation of nature show us “why” in a causal sense- we know what forces lead to a Tsunami, investigators discovered how those fires in Yellowstone were started. But theologically, this suffering will always be a mystery. We can imagine an alternate history, an alternate universe in which there are no deadly forces of nature, in which humans never betray or do violence to one another. Saying “suffering is a mystery” can sound like a cop-out. But I know that when I hear about a tragedy, my mind immediately protects itself from the reality of suffering by imagining I can defend myself from it: I take comfort in the fact that I live too far from the ocean for a tsunami to ever threaten my home, I lock my door, I buy homeowners insurance. We want to protect ourselves from the truth that suffering comes to all living beings, and we cannot control or predict it. This is what I mean when I say “suffering is a mystery.” It is easier to hold on to the idea that if I am only good enough, suffering will pass me by. But if we look at the lives of those we elevate as living truly good lives- Martin Luther King, Ghandi, Mother Theresa, these are not lives free from suffering. These are folks who responded to suffering with transformative goodness. Part of the question “Why do we suffer” is “how do we respond to suffering?” I believe the first thing we are called to do is to “stay awake” as Jesus asked his followers to do in the Garden of Gethsemane. This is really hard, whether it is our own suffering, or the suffering of others. But as Jungian psychology suggests, there is an enormous psychic cost to trying to escape our suffering. I imagine each of us in this room has events in our past that we’d rather not think about, memories too painful to examine. And so our psyches provide us with the useful coping mechanism of being able to repress, ignore, turn away from those memories. But I hope that each one of us has also had the experience of looking with courage at some painful memory, or dynamic in our life and found that when we did the energy for transformation, for new life was released. Some healing and growth and is only possible when we can stay awake to that pain. Not clinging to pain, not pushing it away, but just being able to stay awake in the presence of it. This is what it means to be part of the interconnected web of life. When the mangrove trees are cut down to make room for shrimp farming, the coastline suffers. When the prairie dog is exterminated, dozens of other species suffer, even the soil suffers. Many Unitarian Universalists have had profound spiritual experiences in nature, feeling the beauty and peace of an old growth forest, feeling deeply connected in a numinous moment. But that very connection to nature opens us up to profound pain as well, when we see that forest ravaged by fire, or clear-cut by human hands. For those of us who believe the divine is not separate from the world, that the spirit of life is present in every tree, every cricket, every human being, we know that God is part of the body of the earth as we are part of the body of the earth. This calls us to deepen our connection to the web of which we are a part, and to witness, to speak out, to call one another to action when we are aware of the suffering in any part of the web. That complicated recycling and composting system we’ve got in the other room- that is part of our response to the suffering of the earth. When this congregation hosted a water testing program so that we could test local creeks for changes on toxicity, that is part of our religious response to the suffering of the earth. When Maggie and Chris and Katie went down to Selma last weekend, it was because they wanted to witness to the suffering caused by racism that is also a part of this web of life. One reason we start each service with Joys and Concerns, is because we know this beloved community must be able to hold our good news with sympathetic joy, and to hold our suffering with compassion. This is not always easy. When I hear about the death of someone in your family, maybe I am flooded with memories of the death of someone close to me. When I hear about your upcoming surgery, maybe I am frightened over my own health. When I hear about your pain, maybe I am struck by my helplessness to take your pain away. The very word “Compassion” comes from the root words meaning “to suffer together.” The more we are able to stay awake to our own suffering, the more we are able to be present to the suffering of others. Even when we can’t fix it or take it away, acknowledging the reality of suffering in the world helps us grow in our compassion for one another. During this time of year when our Christian neighbors are celebrating Lent, let us not turn away from suffering. Even there in those hurting places the divine is present. Now when the muddy earth is just beginning to emerge under the melting snowpack of a long hard winter, remember that the spirit of life cannot be separated from the body of the earth, any more than we can. It can be found both in the joy and in the sorrow. And there even in the deepest suffering is the promise of growth and new life.